Christian Aid Groups Tread Lightly In Muslim World Faith-based groups are often viewed with suspicion in Muslim nations, and some say they face a level of violence and intimidation that has made it difficult to carry out humanitarian missions. 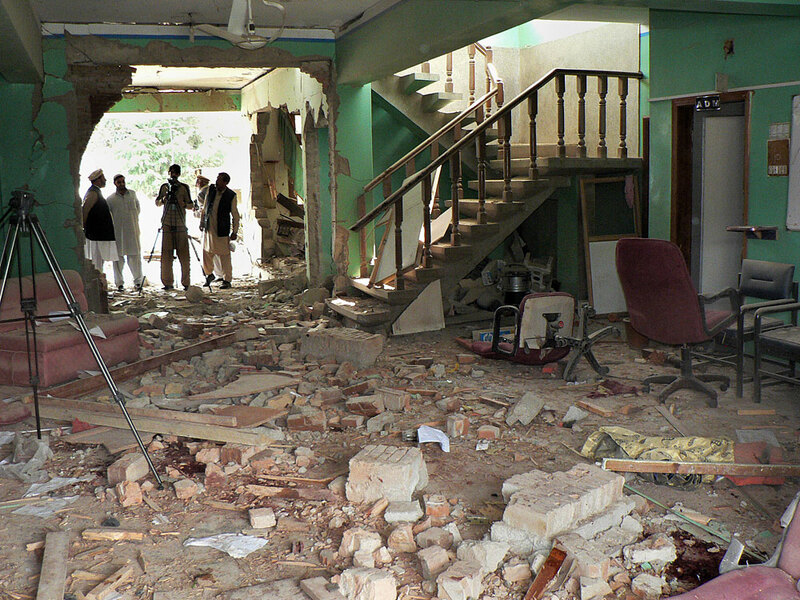 The slayings of 10 Christian aid workers in Afghanistan a week ago underscores the peril. The U.S.-based Christian aid group World Vision has operations in nearly 100 countries, including this clinic providing maternal and child health care in Afghanistan. An attack on a Christian aid group in Afghanistan that left 10 medical workers dead a week ago underscores the perils of faith-based organizations that operate in Muslim nations and the perception that they are promoting a Western agenda. Six Americans, two Afghans, a German and a Briton working for the International Assistance Mission were gunned down in northern Badakhshan province in what Afghan officials say is the worst such attack in the country's history. The Taliban claimed responsibility, saying the medical workers were trying to convert Muslims and were carrying Bibles written in Dari, one of the country's two main languages. 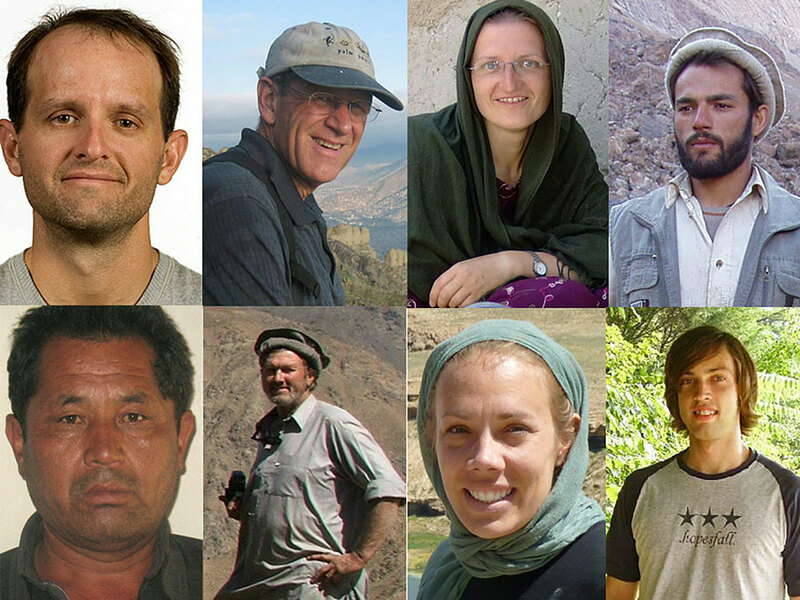 This image from the International Assistance Mission shows eight of the 10 medical workers slain Aug. 5 in Afghanistan. Clockwise from top left: Glenn Lapp, Tom Little, Daniela Beyer, Jawed, Brian Carderelli, Cheryl Beckett, Dan Terry and Mahram Ali. "Our faith motivates and inspires us -- but we do not proselytize," IAM's executive director, Dirk Frans, said in a statement shortly after the attack. He discounted the Taliban claim, telling reporters Thursday that he believes it was an "opportunistic ambush" by Pakistan-based militants. Christian groups are often viewed with suspicion in Muslim nations, and some say they face a level of violence and intimidation that has made it difficult to carry out humanitarian missions. The overall number of attacks on humanitarian aid workers worldwide has risen sharply over the past decade, according to the Aid Worker Security Database. Since 2006, most of the violence has occurred in Afghanistan, Sudan, Somalia and Pakistan, all predominately Muslim countries. Although there is no clear indication that faith-based organizations have been disproportionately singled out, it is "reasonable to assume that organizations with a clear Christian identity face an additional layer of vulnerability," said Abby Stoddard of the consultancy Humanitarian Outcomes, which produces the aid database. "This is a dangerous business, no question about it," said Dean Owen, a spokesman for World Vision, a U.S.-based Christian aid group that has missions in nearly 100 countries. In March, a World Vision office in a small town in northwestern Pakistan was stormed by suspected militants carrying rifles and grenades. Six Pakistani Muslim staff members, including four women, and one Western aid worker were killed. World Vision said the attack in Ogi was the deadliest in the group's history and suspended all operations in Pakistan for about a month. Suspicion immediately fell on the Pakistani Taliban, who have issued statements against Christian aid organizations in the past. But Owen said he's "not sure we will ever fully know what happened" or the reason for the killings. World Vision has since been forced to beef up security, Owen said, and staff members have had to complete the same "hostile environments" training courses often taken by journalists heading to conflict zones. While the group was founded in 1950 in part to spread a Christian message, Owen said that for decades, it has been extremely careful to separate humanitarian activities from anything to do with religion. But accusations of proselytizing persist. Earlier this week, World Vision and two other Christian groups -- U.S.-based Adventist Development and Relief Agency and Sweden-based Diakonia -- were expelled from areas of south and central Somalia controlled by the insurgent group Al-Shabab for what it charged was missionary activities "in the guise of humanitarian work." "I can assure you that's not the case, because most of our staff in Somalia are Muslim," Owen said. Elizabeth Ferris, a senior fellow at the Brookings Institution who focuses on the international community's response to humanitarian crises, said established faith-based organizations rarely mix religion and aid. Most, she said, "are doing everything they can to avoid charges of proselytism and to keep missionary work separate from the humanitarian work." Ferris acknowledges, however, that some organizations are more overt about their evangelical message and have contributed to a perception in Muslim countries that Western humanitarian groups have ulterior motives in providing aid. That's especially true for U.S. groups operating in Iraq and Afghanistan. "One of the trends we see in the last decade or so has been a tendency to see the humanitarian enterprise … as Western, liberal, Christian -- as pushing a particular political agenda quite apart from the activities of these groups," Ferris said. Most aid groups have signed a code of conduct laid out by the International Federation of Red Cross and Red Crescent Societies that specifically prohibits humanitarian organizations from using aid "to further a particular political or religious standpoint." Many U.S.-based Christian relief groups also receive federal money through USAID's Center for Faith-Based and Community Initiatives, which sets similar conditions on any funds it issues. Compassion International USA says it has had no problem openly spreading an evangelical message. "We're open-handed and transparent to the families that we work with," said Mark Hanlon, senior vice president. "We let them know that there's a spiritual element and that a child will be exposed to the gospel of Jesus Christ. Most parents say that's fine." A World Vision office was shattered in a March attack by suspected militants carrying rifles and grenades in Ogi, a small town in the Pakistani district of Mansehra. Six Pakistani Muslim staff members, including four women, and one Western aid worker were killed. He added, "We certainly don't coerce the children or say, 'We'll feed you if you convert.' "
The group doesn't operate in places such as Afghanistan and Pakistan, Hanlon said, "because we're committed to carrying out our work through the local Christian church, and there simply isn't much of a Christian presence in those countries." Secular groups such as Doctors Without Borders say they are careful to delineate their work from Christian aid groups and even from United Nations agencies, which are frequently seen as an extension of Western governments. "There's a suspicion that we are all in the same pot, so we're very clear about making a distinction," said Brice de la Vigne, the Doctors Without Borders operational coordinator for Afghanistan. David Smock, who studies conflict resolution and religion at the U.S. Institute of Peace, agrees that when groups preach their faith in the Muslim world, it's a perception that "rubs off on everyone else." But even for those organizations that make a point of separating aid and religion, they are still Christian at the core. "What happens if someone asks them to see a Bible or asks them about Christianity, or they are in a group and they fall into a religious discussion? Are the Christians going to remain silent?" Smock said. "Those are gray areas that different groups would handle differently."